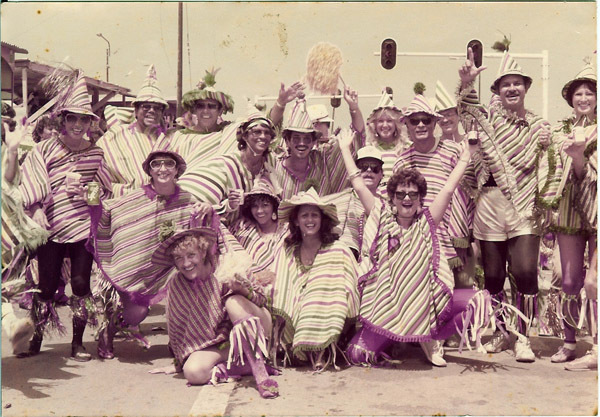 On Thursday, January 20th 1983, John Fingal, Jan Bödeker and Emile de Cuba founded Los Laga Bai carnival group. Late in the evening after a few drinks at the bar of Manchebo Beach Hotel this trio was discussing what to do about carnival. Their problem was, that there was no carnival group to their liking that they could join. John and Jan had always participated with the carnival group Bankanaden, but this group had terminated its carnival activities. Emile had always participated with Tivoli and the last two years with Esso Club. However, due to a strike at Lago it was unsure whether Esso Club would participate in the 1983 Carnival. This discussion lead to the idea of participating in the carnival with a small, low budget group, wearing a simple costume and with the goal of “just having fun”. This would just be a one time thing. Therefore Carnival 1983 would be the only immediate problem. A few days later the late Tico de Cuba, Madeleine Kock and Yolanda de Cuba joined the group. Mauricio van der Ree of Arston Corporation gave moral and material support. The big parade would be on February 13, 1983, so there were only three weeks left to prepare. 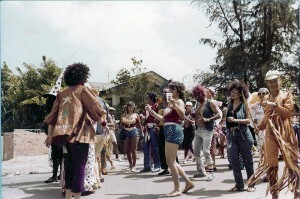 Due to the limited time available, the chosen carnival theme was “Come As You Are”. In other words, dress up any way you like, a real Bacchanal. As a result the name of the group became Los Laga Bai which means “Let it all hang out” or in Dutch “Laat de boel maar waaien”. In order to supply the participants with beverages a bar was quickly built, using Tico’s flatbed truck. Some side frames and a roof were installed and Jan Welmers, in his own unique and humorous way, took care of the artwork. And for many years after that Jan took care of the artwork. Thank you, Jan.
Of course there is no carnival without music. The brass band Hell’s Angels was contracted for a price of Afls. 4,000.-. Registration took place at the office of Arston Corporation in Balashi and in no time 125 people had signed up, each paying Afls. 100.-. The Government (through SAC) sponsored Los Laga Bai with Afls. 1,000. for the brass band. After winning a cash prize of Afls. 100.- the total revenue was Afls. 13,600.-. When it became clear that there was some extra cash, a “Jouvert Warm Up Party” was organized af Hoffi Chona. Manchebo Beach Hotel was requested to cater for food during the parade and to prepare a BBQ with a party at Manchebo Beach Hotel which would take place after the parade. At the end everybody agreed that the money was well spent, leaving a small deficit of Afls. 73.-. The parade was a great success. Everybody had enjoyed themselves and the group had made an impact, both positive and negative. A lot of comments were made on the costume, and people said that the group lacked organization and discipline. Most of these comments came from people who did not understand the philosophy of Los Laga Bai. However, none of these comments bothered John, Jan or Emile as they had pulled off what they set out to do. Los Laga Bai was intended to be just a one time event but the following year, while John, Jan and Emile were looking into joining Esso Club, a lot of people were asking them to repeat the group. The demand became so great that they had no other choice than to organize the second edition of Los Laga Bai. Following that was the third and so on. 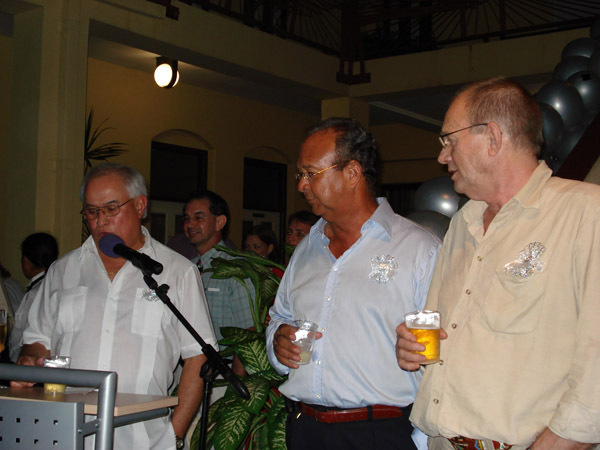 Here is Emile, John and Jan 25 years later at the 25th anniversary celebration of Los Laga Bai. Today, Los Laga Bai is the oldest and still active carnival group in Aruba. Los Laga Bai is now one of the best organized and disciplined carnival groups in Aruba and is considered to be the group with the best “Ambiente”. The group has taken home more prizes for “Ambiente” than any other group in the history of Aruba’s carnival. After having been labeled “a group for old people” for many years, nowadays Los Laga Bai is attracting a wave of young people not only as participants but also in our organizing committee. More and more people have started to understand our philosophy and are eager to join Los Laga Bai. We are very grateful for all the persons and organizations who have helped us since our spontaneous launch in 1983 and we promise to keep delivering the best carnival experience during Aruba’s carnival to the best of our abilities.